Regardless of background or philosophy, practitioners representing virtually every form of skincare and healthcare (Western Medicine and many of the different branches of alternative/complementary healthcare) agree that excessive exposure to UV rays should be avoided due to the risk of developing different types of skin cancer (basal cell carcinoma, squamous cell carcinoma, malignant melanoma). 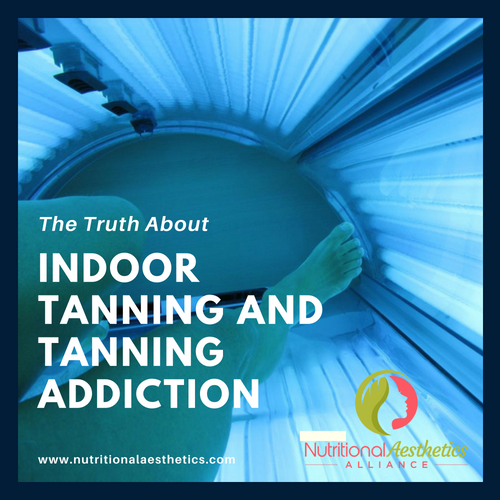 While most consumers are aware of the dangers of excessive outdoor sun exposure and the need for responsible sun protection, indoor tanning beds pose just as much, if not more risk. Are small amounts of indoor tanning safe? The indoor tanning industry has fought back over the years, claiming that only the UVB rays (short “burning rays”) increase skin cancer risk; and indoor tanning products (tanning beds, tanning lamps, tanning booths, etc) mostly use the UVA (long (tanning rays”), therefore there is no risk. However, several experts and findings from recent studies have now come to the conclusion that even the UVA rays that cause the skin to tan, not burn, can cause skin cancer. On the subject of Vitamin D, it is true that some sunlamps and tanning beds do incorporate UVB rays. They claim that because of this, using these devices is a good way to get extra Vitamin D. However, the consensus among experts is that any benefit is far outweighed by the risks. According to Tim Turnham, executive director of the Melanoma Research Foundation, when UVA rays hit the skin, they damage the DNA of the melanocytes (cells found in the deepest layer of the epidermis that produce the body’s melanin pigment), which sends them a message and causes them to produce more melanin pigment to protect the skin from additional damage. This emergency response, that so many people consider to be a desirable skin tone, is a tan. Why do people keep tanning when they know it causes harm? The same question can be asked of cigarette smokers, as well as people who abuse alcohol, illegal drugs, prescription drugs, or other substances. The answer is because they may be addicted. Tim Turnham also noted that in addition to sending messages to the melanocytes to produce more pigment cells for protection, when UV rays hit the skin’s surface they also “start a cascade effect which causes the body to create endorphins, leading to a euphoric response” similar to the one generated by other addictive substances. This causes many tanners to become physically addicted to the UV exposure. Studies on this subject surveyed groups of college students on their tanning habits and thoughts about why they tan. These students were evaluated based on the DSM-IV criteria for addiction, as well as the Cut-Down, Annoyed, Guilty, Eye-Opener (CAGE) questionnaire which was originally developed to identify alcoholics. This 2007 study found that 39.3% of the participants met the DSM-IV criteria, while 28% met the CAGE criteria for being addicted to tanning. Tanning addiction can start at a young age. Is there a 12-step program for tanning addiction? If you suspect that you, your child, or someone else you know has a tanning addiction, it is necessary to have them evaluated by a mental health professional who specializes in treating addiction. Often, people with addictions or addictive personalities also suffer from other underlying mental health issues which require counseling or other professional intervention to treat. Have you experienced tanning addiction either personally, or witnessed it in your practice? Does your salon or spa still have sunlamps or tanning beds? How do you educate your clients about tanning safety? Please share your thoughts in the comments below! *This article is an update from this initial post on NAA President, Rachael Pontillo’s Holistically Haute™ blog.